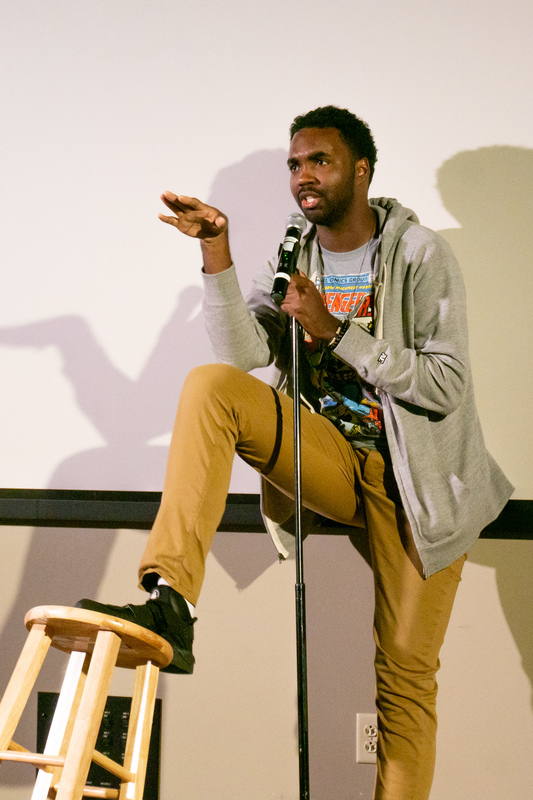 Comedian Lafayette Wright performs in Warch Cinema. On the evening of Friday, Nov. 2, comedian Lafayette Wright performed in the Warch Cinema. Wright is a veteran of the Washington, D.C. comedy scene and has recently been featured on Kevin Hart’s Comedy Central show “Hart of the City.” He now performs regularly in both D.C. and New York City. The show’s attendance was quite low – there weren’t more than 20 people in the audience. Unfortunately, this is typical of most campus-organized events. It’s a well-known fact that it’s nearly impossible to get Lawrence students to show up to things like this, especially without the lure of free food. It’s a shame, because Wright’s act was quite good. A good comedy act is more than merely reciting jokes. I’ve always been fascinated by the ability of a good comedian to “read” an audience and tailor their act accordingly. Moreover, a good comedian knows how to keep a light touch when joking about sensitive topics and how to recover their rapport if the audience decides that a particular joke crossed a line. Although they may seem to be speaking extemporaneously, their material, delivery and timing have been carefully planned and practiced. While projecting an engaging and genuine stage presence, the comedian is constantly responding to subtle cues from the audience — to maintain their stage presence, this interplay must appear effortless. This sort of acumen is characteristic of all of the greatest comedians, but I’ll single out my personal favorite, the inimitable Bill Burr. If you haven’t heard the name, you owe it to yourself to check out at least one of his Netflix specials. In 2006, something happened at one of his shows that was so uniquely jaw-dropping that it is now known throughout the stand-up com edy business as “The Philadelphia Incident.” By the time Burr took the stage for his set, the crowd of Philadelphians was already unruly and intoxicated. Previous acts had already been mercilessly heckled and booed off stage. When the crowd began to turn on Burr, however, he didn’t back down. In front of a swarm of irate, drunken Eagles and Phillies fans, Burr abandoned his regular act and unleashed a 12-minute tirade aimed at the entire city of Philadelphia. I can’t give you much more detail because Burr’s rant was as obscene as it was ingenious. Don’t fret — a quick YouTube search will allow you to see the spectacle for yourself. As the jeers and boos intensified, so did Burr. It was truly one man versus Philadelphia, and Burr held his ground so well that near the end of the tirade, the cacophony of the crowd became mixed with cheering and clapping. I’m mentioning this saga because it’s one of the greatest instances of a comic’s intuition. Burr realized that he was in a situation where fire could be fought with fire. The crowd was already hostile, so there was no additional risk in playing the villain. His rant began with a series of brusque insults to Philly’s sports teams, food and culture — not exactly comedic gold — but the comedic tension picked up as Burr continued his offensive. The crowd itself became a source of comedy — their indignant roars in response to being told that the Eagles will never win the Super Bowl, their gradually waning gusto as Burr began to seriously wound their Philly pride, the confused blend of cheers and boos as the crowd came to admire his moxie. To me, this is pure artistry, and I saw some of that same artistry in Lafayette Wright’s act. The Lawrence crowd remained lukewarm, even as Wright attempted to interact with them and break the ice. Nevertheless, he kept his cool and his charisma, soldiering on with his act and maneuvering through a few potentially awkward moments. Once he realized that Lawrence isn’t exactly the best place to land sports-related jokes, he shifted his focus to superheroes and comic-book culture. Much of Wright’s material involved touchy subjects like race and sexuality; he succeeded at getting laughs with somewhat offensive humor and quickly adjusted his tone during the few instances where a punchline was followed by silence. Lafayette Wright is no Bill Burr, but he’s a skilled comedian with a solid and respectable act. It’s too bad that more people didn’t come out to see him; I was laughing consistently throughout the show. Stand-up comedy truly is a performing art, and I’d genuinely put it on par with professional theatre or dance. Like a ballet dancer, a good stand-up will make it look easy, but beyond appearances there is a tremendous amount of complexity and difficulty involved.